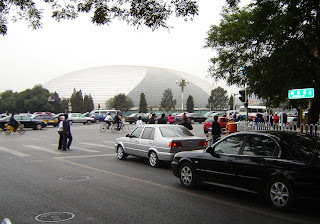 The second World UFO Conference is planned for Beijing in September 2007. This venture is being spearheaded by the energetic Dalian UFO Research Association, which was behind the first World UFO Conference held in Dalian during September 2005. I attended that conference (see my blog archives and my report "The UFO Experience in China" which can be read at http://www.auforn.com/Bill_Chalker_36.htm ) and while there were "lost in translation" effects it afforded an excellent opportunity to further develop contacts with key Chinese UFO researchers and witness various manifestations of Chinese ufology. Jan Fan of the Dalian group is helping drive the effort to hold the new conference. An official opening is planned to be held at the Great Hall of the People, which should attract attention. The experience of the first conference should help the conference organisation committee to address particularly the "lost in translation" issues, and facilitate an important opportunity to showcase Chinese ufology and important international perspectives and issues in UFO research. The 2005 conference allowed me to undertake detailed interviews with key Chinese researchers such as Sun Shili, Zhang Jingping, Professor Ling Huan Ma and Professor Chen Gongfu, and to undertake detailed reviews of key Chinese cases. I was able to further build on this momentum through on going translation efforts particularly via a Beijing based interpreter and a researcher meeting organised for me in Beijing during my last visit there in October 2006. A detailed picture of Chinese ufology is emerging through these efforts.